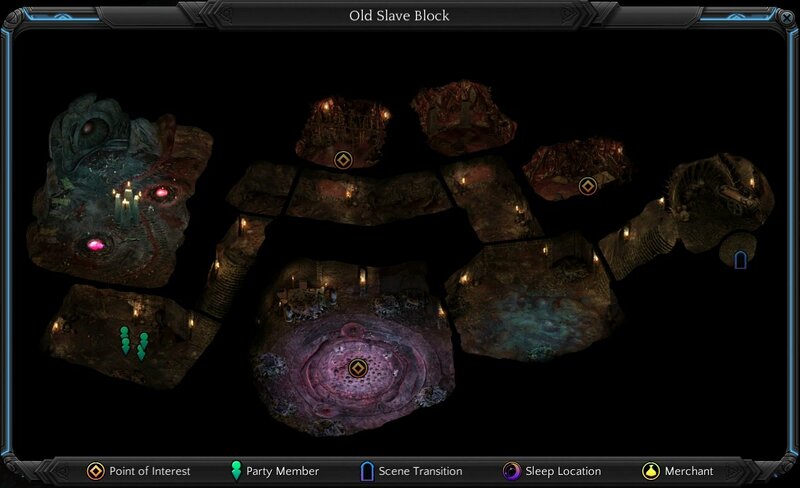 Old Slave Block is a location in Torment: Tides of Numenera. Murdens guard this area, you can talk them to let you pass, easier if you have Magmatic Annulet. There is a woman named Skoura the Faceless in one of the cell, she asked you cure her eye, What the Winds Took. One of the missing patrols can be found in another cell (One of them is actually father to the Children you met on Cliff's Edge). Becareful there is a trap on cell door. If you want to set them free, ask them to hide in next cell, then tell murden guards their prisoners are gone. Then tell the prisoners to run. In the largest cell, there is a murder imprisoned. You can decide to let him escape or not. Inside the cell, some tiny Maws will attack you. Defeat them will open a portal to Murdens' Treasure Vault. Face them alone and you will die.